Rep. Abigail Spanberger (D-VA07) is under fire from the right for what she believes is an unfair reason. She voted against an amendment Rep. Dan Crenshaw (R-TX02) proposed in the House against illegal immigrant voting, but claims this doesn’t represent her position. On a recent radio interview, Spanberger had to come to account for the apparent double talk. “[T]he procedural vote that you are referencing was a resolution affirming, just noting, that only U.S. citizens should be allowed to vote in elections, and so I did vote against that procedural amendment” Spanberger said. However, this was the main vote that killed Crenshaw’s measure in the House. Additionally, Crenshaw’s amendment was not intended to cover only federal elections. Fredericks raised the point to Spanberger that she appeared to vote differently than her stated position. Fredericks continued his line of questioning on some of the major agenda items of the Democratic Presidential nominees. Since Spanberger is a Democrat, Fredericks explained he wanted to know if she differed from the far-left members of her caucus. “Your Democratic presidential candidates are talking about increasing the number of Supreme Court justices from 9 to another number so I have to ask the question, are you in favor of that?” Fredericks asked. Spanberger answered that she didn’t know, but was considering what the effects of that play may be. However, when the questions turned to eliminating the electoral college Spanberger avoided giving a straight answer at first and tried to turn the tables back on the radio host. “Well, I’m going to first ask a question. 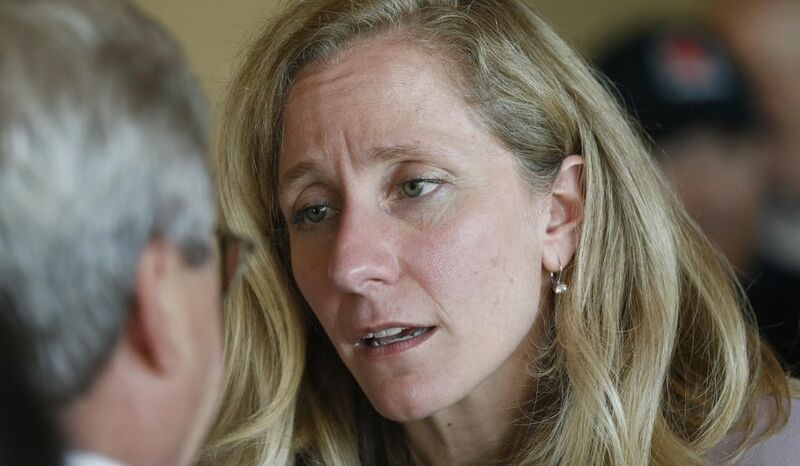 Is part of the concern that you might have about this, John, the fact that voters might vote a different way than what you would?” Spanberger asked. “I’m going to go with the Founding Fathers on this… like with the Constitution and other things that I believe in. I’m going to go with their judgement” answered Fredericks. Spanberger went on to explain her support for the idea of a national vote over the electoral college. Apart from the Green New Deal, Spanberger didn’t name any major proposals from Democrat Presidential candidates that she would oppose. Unfortunately for the Congresswoman, failing to distance herself from the far-left members of her caucus may harm her re-election bid in VA-07 which went blue this last election for the first time since 1971. Oh, yeah, Spanberger is learning the Washington two-step really well. First, go to Washington and vote against the majority in your district and hope your constituents don’t notice and vote the demorat party line. Then, on the most controversial matters, just give some bull answer. We need to send her back to Glen Allen and get a real conservative back in the 7th. I am 100% sure liberal tax loving Jennifer Wexton voted to allow illegal aileins who broke US law to vote in a US election. So Wexton, what did you learn in Law school? Obviously not how to uphold it. What a disgraceful American and unpatriotic person. It is already against the law for illegals to vote in national elections. She is going to be another hypocrite liberal forked tongue socialist. What in the world are these crazy liberals thinking? They’re all committed to tearing down this great country! Common sense needs to be restored. My thoughts are that if the District wasn’t Jerry rigged and Still included Hanover County she never would have won! She’ being a westend Brat is a disappointment to her fellow high school students, She needs to support her fellow Richmonders and stop being a democrat and start being an American . She obviously is another left leaning Dem. Says she is a mderate but her actions or lack of show she works towards and for the radical left agenda. which will only undermine our nation, what it stands for ,and was founded on. So much for rule of law. She threw around defending the nation by working for the CIA. But obviously it’s just another smoke screen. However I am going through troubles with your RSS. I don’t understand why I can’t join it. I think the Democrats are drinking from the same poison water fountain. They have lost their freaking minds. They are so crazy that there is a Republican President in office, they ‘re gashing their teeth and slashing their wrists with their decisions to side with left wing idiots trying to bring this country down. As my mother used to say ” Give everything away and start shitting through our ribs.” That is what happening in this country, destroying our laws, our Constitution and our American citizens way of life.